Wow - this year is flying by. I'm glad I'm not doing the 52 books in 52 weeks challenge because I would be WAY WAY WAY behind. 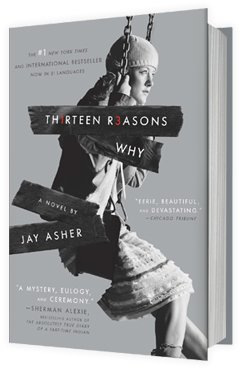 But I did get a couple books read during March including "Thirteen Reasons Why" by Jay Asher. I found out about this book because it's about to be a series on Netflix and it looked interesting. Plus, I'm a unashamed fan of YA lit, so I thought I'd check it out. The story is a bit dark. It's the story of a high school student, Clay Jensen, who comes home from school one day to find a package with 13 cassette tapes in it. That's right - cassette tapes. The tapes were recorded by Hannah Baker, a classmate who committed suicide a few weeks prior. What was on the tapes? I'm not going to tell you! But the book contains some mystery and intrigue, and it really made me appreciate the fact that I'm not in high school anymore because it sounds horrible. It was a good read though. It didn't end the way I thought it was going to, which was kind of disappointing, but still worth the read.